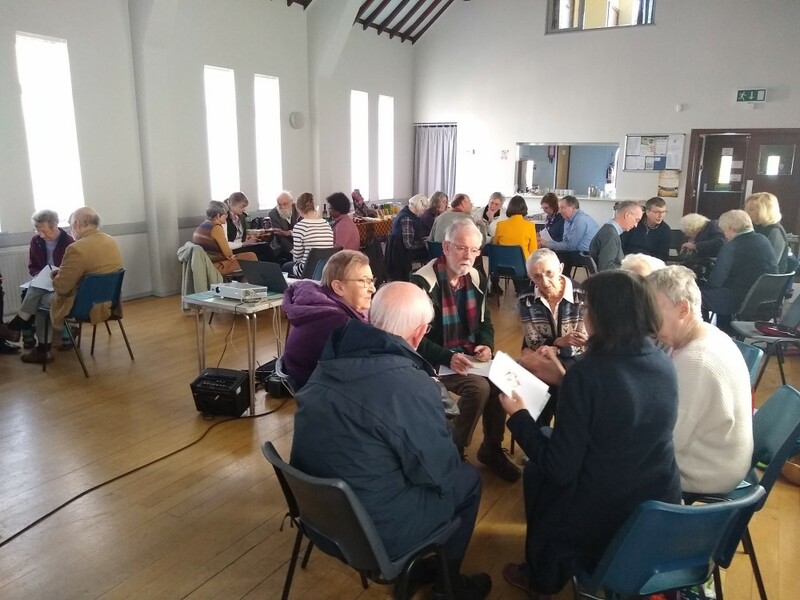 About 30 people gathered from ten parishes at SS John Fisher & Thomas More parish (Burley in Wharfedale) on Saturday 30 March to reflect more deeply about ‘Caring for our ‘common home’: the Earth’. This day of Reflection organised by the Commission was also partly a trial run of some of the resources that CAFOD have recently developed for celebrating creation in parish settings. 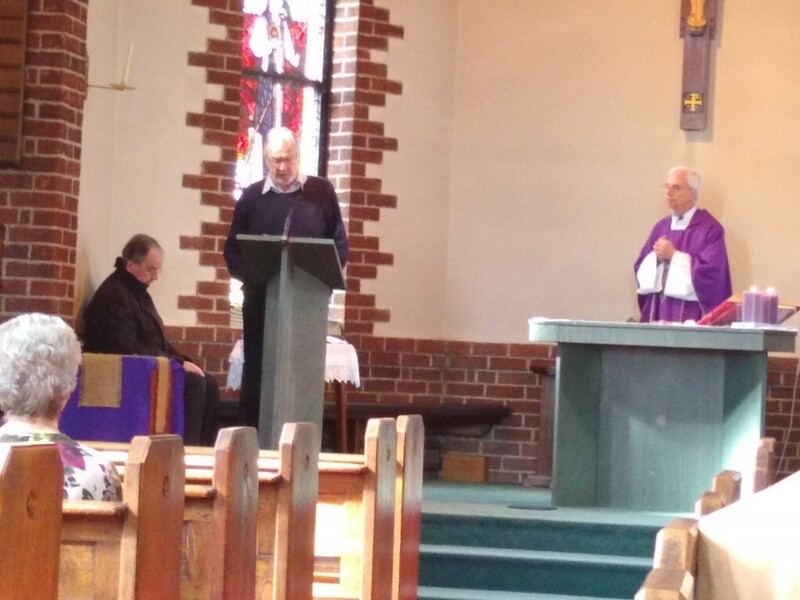 The day started with the usual parish mass. However, we included some Prayers of Intercession especially written by CAFOD for a creation celebration. These were read by the Commission Chair, John Battle. The parish priest, Fr Michael Mahady, used one of the special Eucharistic Prayers, one centred on Justice & Peace. These simple additions made for a good preparation for the rest of the day. The more formal part of the day started with a reflection using some of the key quotes from Pope Francis’ encyclical ‘Laudato Si’. Following this there were some short inputs to explore what the pope meant when he talks about ‘integral ecology’, ‘ecological conversion’ and ‘community conversion’. Everyone then buzzed in smaller groups for a few minutes to explore their own understanding and experience of what the pope was trying to get across. John Battle, Chair of the Commission, reads the Prayers of Intercession especially written for a Celebration of Creation by CAFOD. Michael Emly, from Our Lady of Kirkstall parish, tells everyone about what their parish has been doing as part of working towards the Live Simply award. 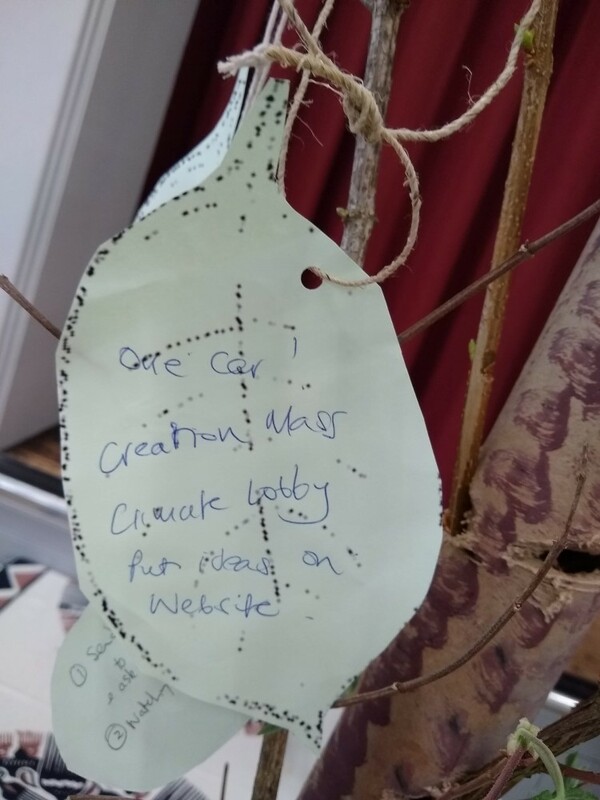 As part of the final liturgy for the day, people came up and hung their ‘action leaves’ on our Tree of Hope. We finished the morning with some ‘Stations of the Forest’ a reflection about how we are abusing the forests and destroying our environment in the pursuit of profit, a video resource developed by the Columbans. We started the afternoon with a guided reflection about our five senses. This was followed by some consideration of where our reflection might lead us – what kinds of action might we take. 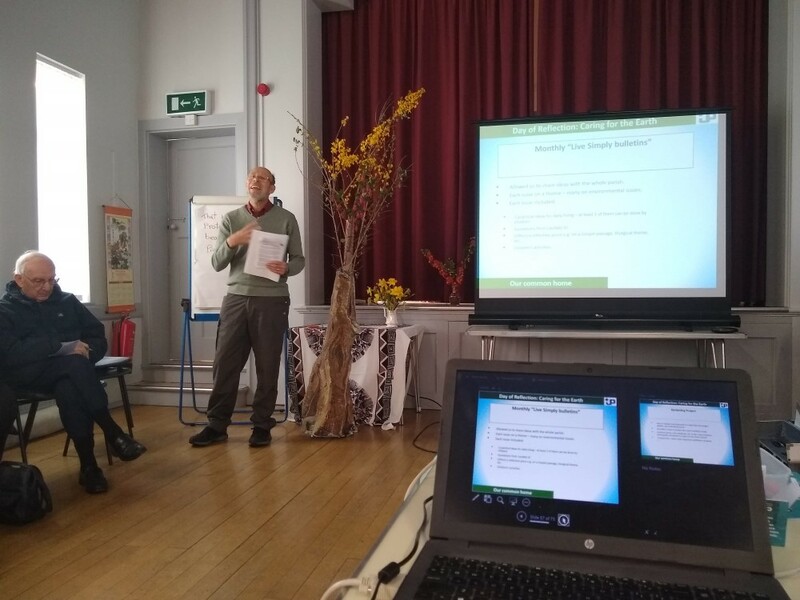 Michael Emly, from Our Lady of Kirkstall parish in Leeds, spent a few minutes explaining all the actions the 3 church communities in their parish had taken over the last two years as part of working towards the CAFOD Live Simply award. The surveys that they undertook at the start of the process and more recently show that a significant number of people have changed their lifestyle as a result of the programme. Moreover, there has been significant involvement from many in the church communities and across the communities – both renewing the parish and bringing parish members together. We followed Michael’s input with two short videos – one showing indigenous people from the Philippines resisting mineral and mining exploitation of their land and one a short video of Greta Thunberg, the young Swedish climate activist. As in the morning, people were asked to buzz for a few minutes in smaller groups about what they had seen and heard. They were also asked to commit to an action that they could take away from the day. 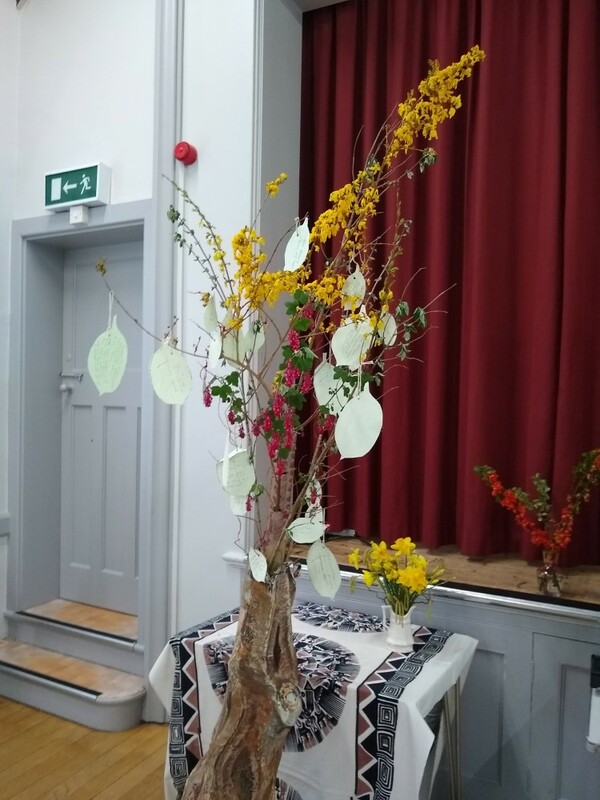 We finished up the day a final liturgy where people came and placed their actions – which had been written on paper in the shape of a leaf- onto a tree to signify the hope of the new buds already developing from the day.